A career in hospitality was written in the stars for David McCoy, although he initially resisted following his father into hotel management. David was born in the Isle of Man where his father John worked as a hotel manager. Returning to Ireland when David was just a few years old, John took over as manager in County Sligo Golf Club, later taking on Strandhill Golf Club as well. Rosses Point was a perfect spot for David and his three older sisters to grow up in; with the glorious beach just down the road. He also has idyllic holiday memories of his parents native Wexford– mainly of sunshine and strawberries. David chose Heritage Studies then Business and Tourism as his college courses, and Galway was to be his home for the next decade. He continued to do bar work at weekends and holidays quietly gaining experience in the industry, almost unbeknownst to himself. This led to his first ‘real’ job after college – managing a Galway pub. He leased it for three years, running a successful night club as well. After this it was a short step into the hotel business proper and in the height of the boom he became general manager of the King’s Valley Hotel. Although it was good for business, David found many of the excesses of the good times distasteful and feels it brought out the worst in some people. He had a different challenge to face a few years later when he was managing the Oranmore Lodge Hotel and the recession hit hard. Those were tough but character building times and David learned a different side of management, putting people on three day weeks and watching budgets like a hawk. 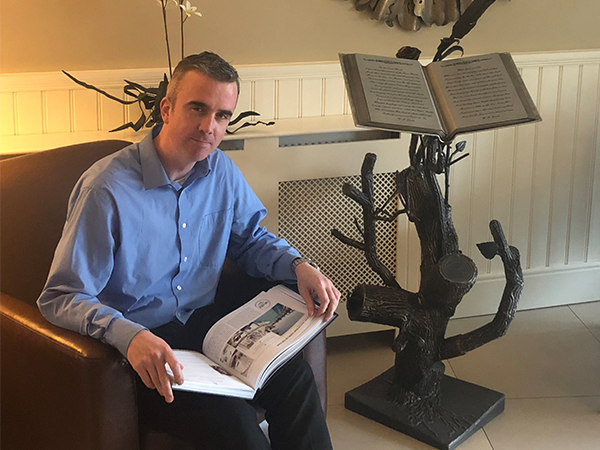 The moment David heard about Strandhill Lodge and Suites he loved the innovative concept – a top quality boutique hotel with superior accommodation. It fits perfectly into Strandhill and supports rather than competes with the wonderful bars and restaurants. He has been there since it opened in 2011 and is totally animated as he describes the award winning hotel and the total commitment to quality from owners Mary and Damian. Their location on the Wild Atlantic Way and the launch of the brand was a major boon for business. Since college days when he was president of the Students Union, David has been active in the community. Now his commitment is 100% to Strandhill and he works closely with local businesses to promote the area. His view is that a rising tide lifts all boats and he is surrounded by other enthusiastic business owners and managers who share his outlook.